It starts with a glance. One of those looks that transform a person with a wonderful chill, like a jolt of electricity or a shock of life that wakes one up after a long winter’s nap. Then a conversation follows, the small talk that is awkwardly and terrifyingly wonderful. Fleeting gazes, secret looks, and moments of longing build with a swell of passion that one can hardly contain. Carol is like falling in love. The film is love at first sight, and it grows and grows on a viewer with its beauty that swoons and spins one head over heels in love. There’s a reticence to its languid longing, though, and the reserve of Todd Hayne’s masterful feat with Carol is that it evokes the kind of feeling of being in love, but of being terribly afraid that the other person doesn’t love you back. The film starts with a glance as plain little shopgirl Therese Belivet (Rooney Mara) spies Carol Aird (Cate Blanchett), a well-to-do patron in the toy department of the store where Therese works. Carol is one of those gorgeous, larger than life people to whom all eyes turn when she enters a room. She just has that kind of aura. Therese fells it—the warmth of Carol’s glow and the spark of life that rouses her from her slumber as she watches Carol coquettishly examine a train set at the store. The characters speak not a word in this moment, yet the actresses say so much in their exchange as Therese locks eyes with Carol as she looks at the set. “Go ahead, turn it on,” Mara’s eyes saying with longing as Therese immediately wants Carol to have all that she can give her. Blanchett, captivating as ever with her catlike eyes, flirtatiously tests the limits of what she can and cannot do in this public space. What follows is an intoxicating seduction as Carol develops the romance of these two women in 1950s’ New York. Director Todd Haynes (Mildred Pierce) gorgeously and extravagantly realizes this note-perfect adaptation by Phyllis Nagy of the wonderful book The Price of Salt by Patricia Highsmith (The Talented Mr. Ripley). Carol is largely faithful to Highsmith’s novel, save for a brief framing device that positions Therese and Carol’s relationship as part of a retrospective as Therese looks back following what seems like a final farewell after Carol bittersweetly gives Therese a pinch on the shoulder as she walks out of the dining room. The film doesn’t offer much to introduce Carol, but as Blanchett exits the room, the energy in the scene pulls like a vacuum as Carol takes the life, the spark, and the air out with her as Therese sits and catches her breath. The story runs with a premise that, as Highsmith explains in her notes on The Price of Salt, began as a bit of speculation during her days as a shopgirl while her first book Strangers on a Train was awaiting publication. She writes that a beautiful older woman visited her counter and filled the room with energy—Highsmith describes a magnetism, both in her notes and in her book, which creates an instant attraction and curiosity. What was fleeting in Highsmith’s life becomes immortal in this adaptation of her book. Carol is arguably the finest page-to-screen effort of Highsmith’s work. The film, like the book, has elements of a thriller even though it diverges largely from the oeuvre of mystery and suspense for which readers know Highsmith. It delicately creates an intensely compelling air of suspense as Therese and Carol try to realize their love in a world that deems it illicit. Cue the Highsmithian elements as Therese and Carol hit the road (sort of Thelma and Louise style) and they develop their relationship while travelling across America, all the while dodging spies set on Carol by her vengeful soon-to-be-ex-husband Harge (Kyle Chandler). Carol, however, isn’t a tale of forbidden love. Rather, it’s a story of love in the purest and truest sense as these two women discover each other—and themselves—in a transformative journey. Not once does Carol features the words “gay,” “lesbian,” or “queer” as Therese and Carol explore their relationship or while Carol and Harge negotiate the termination of their marriage. Therese and Carol don’t talk about “when they first knew” or anything like that—although Carol recalls her first tryst with Abby (a strong Sarah Paulson), her first female partner and long-time friend. Carol doesn’t define its characters by their queerness; instead, it creates a portrait of two people in love. It’s as simple and complex as that. Carol’s a film of few words, really, as the great power of the romance comes through the glances Therese and Carol share as they discover one another. The film is a swooning melodrama as the cinematography by Ed Lachman makes stunning use of corners, mirrors, and doorways as the women begin their romance in secret and gradually withdraw from the shadows, and see themselves in new frames as their ideas of love change. True love doesn’t need any words to feel rich and pure, and Carol has two actresses who more than capably convey the power of love through silent exchanges. The film builds to a powerful shot/reverse shot that could only be so moving with actors as strong as Blanchett and Mara are as gazes meet with an eyeline match and heaving breasts. The anticipation, excitement, and energy are palpable. 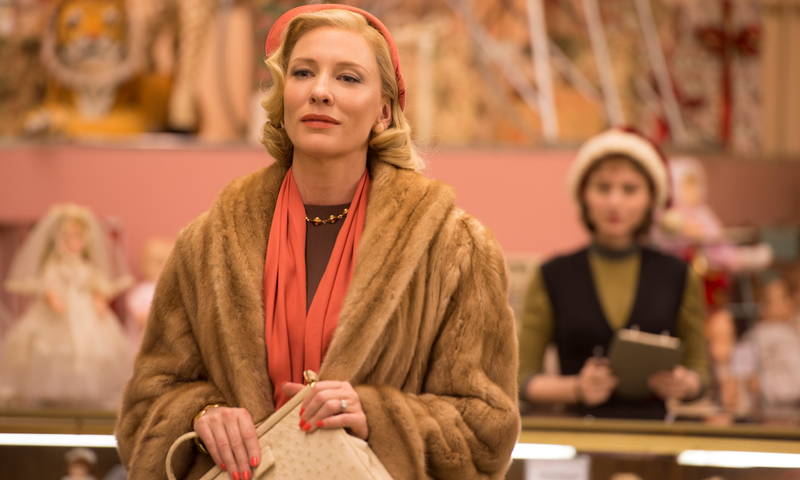 Every frame of Carol bursts with life and love thanks to these remarkable actresses. Blanchett, in the title role, gives one of her best performances in a part for which she is dreamily cast. (Casting directors rarely receive a shout-out in reviews, but Laura Rosenthal deserves major kudos for casting each role in Carol to perfection.) Blanchett has a natural elegance, mysteriousness, and playfulness with the way carries herself and teases with her big enigmatic eyes, and she brings out every ounce of Carol’s larger-than-life charism. It’s impossible not to gravitate towards Carol as fondly as Therese does. “Flung out of space” is Carol concisely as Carol’s beguiling seduction of Therese sees the young girl as a strange anomaly. She’s something foreign, yet captivating. Carol, too, feels flung out from space: there isn’t anything really like it. The singularity of this beautiful love story offers a wonderful gift that dropped from the sky. Carol opens in theatres beginning Dec. 11 in Toronto.